When you change your print settings from within a program, the changes apply only while you're printing with the program open. If you want to select different settings to use in all your programs, you can change the default print settings in Windows or save a preset of printer options in OS X. Follow the steps below for your operating system. Windows 10: Right-click and select Control Panel > Hardware and Sound > Devices and Printers. 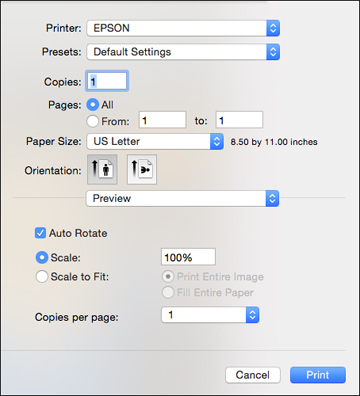 Right-click your product name and select Printer Preferences. Note: Some options may not be able to be saved in a preset. When you are ready to print, click the Presets pop-up menu, select your preset from the list, and click Print. Once a preset has been selected, it will automatically be selected in the print dialog for future print jobs until another preset is selected. Select Standard from the Presets pop-up menu.